Being a long-time Mac and iPhone user, I’ve become a big fan of the Notes app 10 Tips to Get the Most out of Apple Notes on OS X 10 Tips to Get the Most out of Apple Notes on OS X Have you switched over to Apple's vastly improved Notes app? Here are a few tips on improving your workflow. Read More . But after building a Windows computer How To Build Your Own PC How To Build Your Own PC It's very gratifying to build your own PC; as well as intimidating. But the process itself is actually quite simple. We'll walk you through everything you need to know. 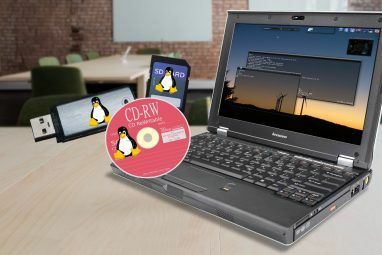 Read More recently, I’ve become a user of both operating systems. Which means I need something that will work on all of my devices. I decided to take a look at Microsoft’s note-taking app, OneNote. Does it beat out Notes as my new favorite? Here’s what I found. For a long time, I used Evernote. And I still think it’s a fantastic tool. But when I just want to jot a few things down, Evernote is overkill Thinking of Switching From Evernote to Apple Notes? Here's How Thinking of Switching From Evernote to Apple Notes? Here's How Apple has a free notes app, and it received a rather substantial overhaul with iOS 9 and El Capitan. But should you ditch Evernote for it? That depends. Read More . Formatting and organizational options fill up the screen and provide a more visually cluttered experience. This isn’t necessarily a bad thing, but I tend to prefer very simple apps to more complicated ones. Especially if I don’t need the full power of something more complex. Notes lets me add notes to different groups, but I only use one or two, whereas my Evernote account had dozens of notebooks and hundreds of notes. You can add text formatting with keyboard shortcuts or through the menus, but the menu bar doesn’t get cluttered up with panes and buttons. Typing an asterisk followed by a space starts a bulleted list. A number with a period and a space starts a numbered one. Links to web addresses are automatically added when you paste a URL. Folders sync with iCloud, and you can sync your Google Keep notes 4 Google Keep Tips And Tricks For Better Notes, Lists And To-Dos 4 Google Keep Tips And Tricks For Better Notes, Lists And To-Dos Read More as well. All in all, it’s very simple, clean, and easy to use. That doesn’t mean that it doesn’t pack some power, though. With the iOS 9 update, Notes received a big upgrade Should You Be Using Apple's Notes for iOS and OS X? Should You Be Using Apple's Notes for iOS and OS X? For the first time since its release, Apple Notes for both OS X and iOS may be worth considering. Read More . You can embed maps and webpages into your notes. Create checklists for task management. Sketch with your finger or a stylus. It still doesn’t pack as much power as more full-featured note-taking apps. But it manages to strike the right balance between a text editor and an organizational system. Microsoft’s OneNote, on the other hand, is quite different. It’s more of a competitor to Evernote than it is one to Apple’s Notes app. Notebooks, like stacks in Evernote, are high-level organizational categories. Sections separate things within each notebook, and each section can also have a number of pages. Sections can be combined into groups OneNote's Best Organization Feature Is Hidden in Plain Sight OneNote's Best Organization Feature Is Hidden in Plain Sight One of OneNote's best organization features is hiding in plain sight. Here's how to use the section groups feature to organize your books. Read More , which is a hugely useful organizational feature. Each page can contain text, images, links, tables, lists, and just about anything else you want to keep there. You can even embed YouTube videos just by including the URL. Like in Notes (and many other modern apps), you can sketch with your finger or a stylus. If you decide to adopt this system, it turns OneNote into a great way to take notes. And its mobile options mean you can use it on Windows, Mac, iOS, and Android. As you might expect, OneNote has a bunch of other cool features owing to the fact that it’s a full-featured app. Many of these features set it apart from Notes. For example, OneNote can do math for you. Just type in an equation and OneNote will run the calculation. You can also click anywhere on the page to start a new paragraph, making it easy to comment on images or organize your notes the way you see fit. The web clipper, quick notes templates, custom tags, note links, version history, and very useful docking all set OneNote apart from Notes. 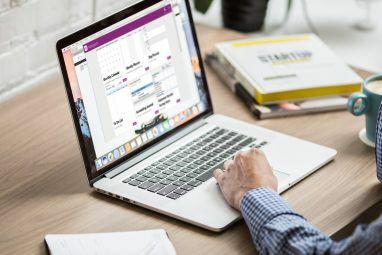 There are a lot of other really cool things it can do 7 Little-Known OneNote Features You Will Love 7 Little-Known OneNote Features You Will Love OneNote is 100% free and packed full of advanced features. Let's check out some of the ones you may have missed. If you're not yet using OneNote, these may win you over. Read More , too. As you can tell, these two apps are very different. 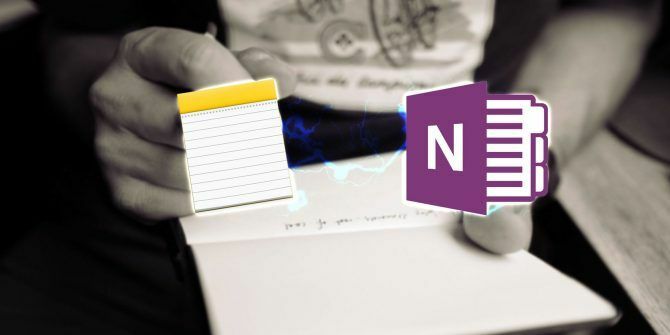 In many ways, OneNote is much more similar to Evernote than it is to Apple’s Notes app (though there are some notable differences Evernote vs. OneNote: Which Note-Taking App Is Right for You? Evernote vs. OneNote: Which Note-Taking App Is Right for You? Evernote and OneNote are amazing note-taking apps. It's hard to pick between the two. We compared everything from interface to note organization to help you choose. What works best for you? Read More there, as well). Unsurprisingly, the two apps are likely to appeal to different types of users. One of the biggest determining factors is if you’re using a non-Apple device. When I use my Windows computer, I can access Notes through the iCloud website. It’s just like using the app, except that it’s browser-based. If you don’t mind using a browser for your note-taking, this is a great way to go. OneNote has an online version as well, but because you can download the app on pretty much any device, you’re less likely to need it. Having notes synced between different devices with different operating systems is a huge benefit to using OneNote. Both apps store notes on their company’s cloud storage (iCloud for Notes and OneDrive for OneNote), so that’s not likely to be a determining factor in your decision. And because both are completely free, that’s not going to help you either — though it does make OneNote a compelling alternative to Evernote Migrating From Evernote to OneNote? Everything You Need to Know! Migrating From Evernote to OneNote? Everything You Need to Know! OneNote is one of the best alternatives to Evernote and it's free. We'll show you how OneNote is different and show you the tools to migrate smoothly. Read More . In the end, it’s likely to come down to whether you want a more full-featured app or a simpler one. Notes is only a couple steps beyond a text editor. It has some very useful features, but it does its best to stay out of your way. It’s a very uncluttered interface. OneNote, on the other hand, presents you with a lot of great tools. You can get rid of the ribbon at the top of the screen to clean up the space, which is nice (there’s even a keyboard shortcut for it). But a lot of what makes OneNote great is contained in that ribbon, so you’re giving up easy access to what might make you choose OneNote in the first place. Similarly, hiding the navigation is great for working on a single note, but makes it harder to move between the things you need to work with. Much like many other software choices, you’ll have to think about your priorities. Will you give up cross-platform compatibility to keep a simple and uncluttered interface? Will you want the power of tagging, drawing, and more organizational options? The answers to these will likely determine which app you’ll want. As for me, I think I’ll be sticking with Notes. Er, maybe converting to OneNote. But probably… well, who knows? Do you use either of these apps? How did you choose between them? Do you have a cross-platform alternative for Notes? I’d love to hear about it! Share your thoughts in the comments below. Explore more about: Apple Notes, Microsoft OneNote, Note-Taking Apps. I was an avid Evernote user and had it installed on five devices and loved being able to use the notes in the field. To this day, I think Evernote is the quickest and easiest to use that is pretty much global. That being said, when Evernote told me I had to pay or limit to two devices, I seriously thought about paying the money to have more devices but at that time, Office 365 was out and I was already paying $99 and that included OneNote. I hated OneNote because every time I would try to learn it over a six or eight year span, I felt like I needed to learn a lot on how to use it. I felt that I could not understand this new concept and it was over complicated for me (and this coming from someone who is in IT). I had also bought my first Apple device - an iPhone and had experimented with Notes as well but felt that the Notes app was way too flat and not as expansive as Evernotes. So, my love for Evernote encouraged me to go ahead and pay for the needed devices but after using some logic, I felt that since I already was paying $99 that I need to use all the tools in my toolbox and before the time was up from Evernote, I exported all of my Evernotes and imported them into OneNote and began organizing and learning the software. But at that time, OneNote was good on the desktop and ackward out in the field so I relied on Apple Notes somewhat because it was simple, sweet, and text based at that time and great for being out in the field. The only downside, as this article states, is there are no apps on the Windows side and I didn't want to access them from a web browser. So as time passed, OneNote grew up and implemented so many new features that for the past two years I have done everything in OneNote and glad I began this years ago as now, I have a really good system. Office 365 is the key as OneNote works well in this ecosystem and I am more productive by being able to have embedded spreadsheets or I am able to quickly create a chart and screen shots directly into OneNote is well refined now (used to not be). Office 365 is fluid in my work flow and I benefit in using my email address that is attached to my Office account sign in to my Windows PC and have OneDrive (6 Terabtyes per account split up 1tb per shared user). OneNote allows me to quickly print pages or documents to it. Ever see a recipe you want to try or at the supermarket on a handout 3 x 5 card? I put those into OneNote under a Recipe Tab organized by types of recipes. I use OneNote for quickly capturing already printed recipes or if I see something on the net, I may capture it. I do use Paprika software that I bought for the Mac and it works with IOS and android devices and with Paprika, I can capture recipes from the web or type them in. Despite how fluid and easy Paprika is, often times when I see a printed recipe it's super easy for me to snap it as a document in OneNote. With OneDrive I am able to scan PDF documents in to folders and then attach them to OneNote for better organization. Everyone I feel has different ways of organizing and there is no wrong way... whichever way is the best way so long as you continue to use it in your workflow and know when it isn't working, to maybe change and do something different. It was extremely difficult for me to make the decision to go from Evernote to OneNote because I loved Evernote so much and if I didn't have a subscription already to Office 365, I most likely would've stayed with Evernote. 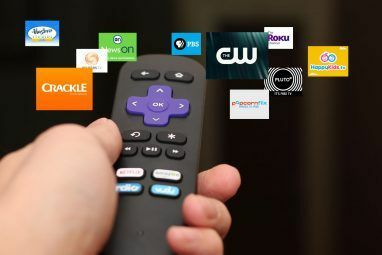 Because of Evernotes' CEO's push towards limiting devices he pushed away many heavy duty customers like myself who would never have paid for a subscription anyways, taking up much of their bandwidth with 1/2 dozen devices syncing all the time. I didn't like his decision, but because of it, Evernote has grown by leaps and bounds and those that do pay have an extremely positive experience and those that are on it for free with two devices or less get to benefit as well. I’m now in a position of having way too many notes on Evernote... and they’re having problems as a company. That’s something to consider for your note taking needs in the future. Google Keep is cited as an alternative but they have a tendency to kill the free services. Imo the only real choice is Microsoft’s OneNote because they’re a massive company. Longevity and reliability go hand in hand with that basically. I used the OS version of Apple Notes and appreciated its simplicity. When I began syncing Notes with my phone through iCloud, I noticed that the folders in the iOS version do not nest. What was a compact interface in my computer has become an unending scroll monster. I need to look more closely at OneNote, but don't look forward to rebuilding my collection of Apple Notes in a new application. Is there a way to export all of your iPhone notes into some other format like plain text or pdf? Evernote - best note taking app around. As for quick notes, Google Keep is great for that, along with handwritten notes, checklists, etc. Evernote is no longer free. Apple Note kinda forces you to use Apple outside of the web version. Google Keep is a decent simple solution. But frankly OneNote is free, is on just about every platform, has all kinds of supporting apps like Lens, has all kinds of plug-ins and extensions, etc. Evermore still has a free version, and I'm tired of people complaining about having to pay for a product. Nothing in life is truly free. I've used OneNote and still feel Evernote is better. Web clipper, note organization, tags, and other features. OneNote is too busy. I am an explor......a teen boy who loves to collect information and gain knowledge. Now recently I have migrated from Evernote to Onenote and I am extremely happy. Completely free to use unlike Evernote which brings in a lot of restrictions on its free users. 3.) EVERNOTE IS QUITE INTEGRATED TO WORK WITH POCKET.............. VERY EASY AND HANDY TO USE BOTH OF THEM. SO IS ITS RELATION WITH IFTT ETC . PERHAPS ONENOTE IS NOT AN INSTANT CANDY LIKE EVERNOTE....... BUT ONENOTE IS CERTAINLY MORE PROFESSIONAL. SIMILARLY I CAN GIVE SOME DRAWBACKS ON EVERNOTE BUT MORE THAT LATER. I didn't take Rann's comment as a complaint that Evernote isn't free. He stated a fact. When comparing two similar products, it's worthwhile to mention that one costs money while the other is free. Ayushman, why do you say that OneNote is more professional?